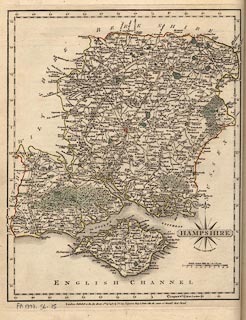 Atlas, hand coloured engraving, Hampshire, scale about 6 miles to 1 inch, in Cary's New and Correct English Atlas, by John Cary, 188 Strand, London, 1787.
inscription:- printed -on- bottom London: Published as the Act directs Sepr. 1st. 1787 by J. Cary, Engraver, Map & Print seller No.188 the corner of Arundel Street, Strand.